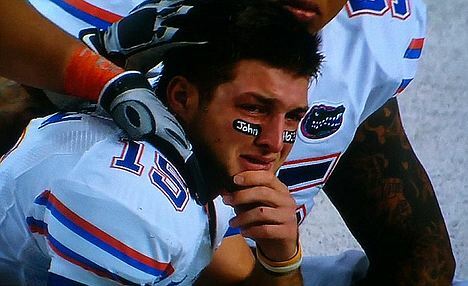 Sometimes sports are sad. Most of the time they aren’t sad-sad, but fake-sad. Two weeks ago, the tortured fans of Ole Miss experienced both kinds of sad on a single play a few weeks ago. Real sad is easy to parse; you knew it was coming the instant Kevin Ware’s body followed his foot to the floor. You saw it on the faces of Marcus Lattimore’s teammates. You could watch it permeate the hushed Vaught-Hemmingway Stadium crowd like a morbid wave. The real sad hurts, duh. But the Fake-sad hurts pretty bad too. The misery that arises when your personal tastes, accomplishments, heritage, geography and a litany of other hyper-personal elements entrust their reputations to total strangers, who must perform in front of total strangers, a performance later assessed by total strangers. It’s due to something psychologists have identified and I have ignored, but no matter. And last Saturday, sad-sad took a back seat to fake sad in Prime Time. 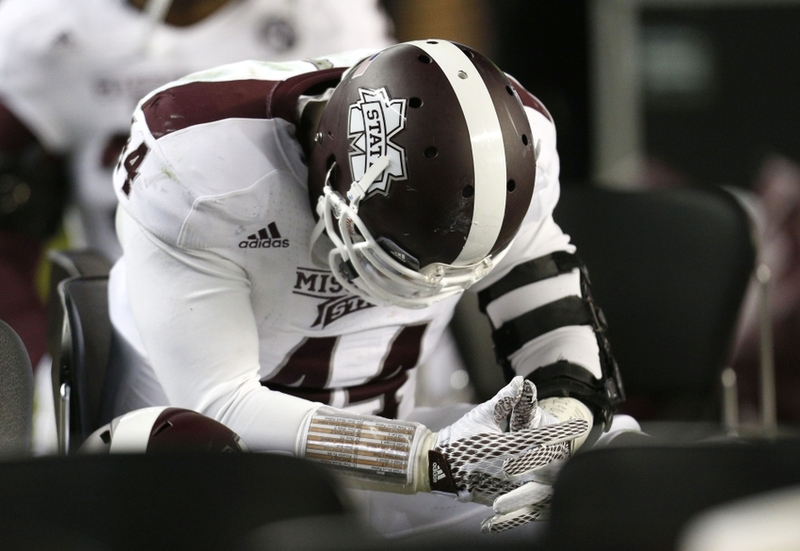 When Mississippi State limped into halftime last Saturday in Tuscaloosa, trailing 19-3 with just 158 yards to their name, things seemed appropriately bleak for the SEC’s newest title contender. Dak Prescott — billed as some sort of Tim Tebow-Ben Roethlisberger-Zangief From Streetfighter combo — had thrown an interception and had otherwise been neutralized. It appeared to be the poster game in the case against the Bulldogs. They couldn’t beat Alabama, and the box score backs that up. They covered the eight-point spread, but it happened with 15 seconds to play. Dak Prescott, the Artist Formerly Known as the Heisman Frontrunner, was picked off three times, including once in Bama’s endzone, and averaged a mortal 3.7 yards per carry on the ground. Amari Cooper, Alabama’s version of a Heisman contender, had himself a spectacular 88 yards and a touchdown, because he’s the best receiver in the country and unless an opposing corner straps a Baby Bjorn to his chest and forces Cooper to carry him around for 60 minutes, it’s hard to imagine him not making a play of 20 yards or more and racking up at least 80 yards receiving1. But the looks on the faces of Mississippi State players in the waning seconds was a look of despondency. A knowing look of a hopeless, fruitless future. The same look worn by countless players before them. They played Alabama about as well as a team could possibly play them in defeat. Their defense held after big turnovers and yielded just one second half touchdown. Their offense racked up 428 yards, 137 more than the Tide allow on average. Prescott didn’t play his best game, but it turned out just a very good game might have done the trick. In the olden days of the BCS system, a late loss like Mississippi State’s would’ve been a condemnation of Papal Proportions. It was a weird standard to establish — lose early, and your team had a chance to claw back in; lose late and you’re better off backing Ralph Nadar in 2016 — but it was an established one to be sure, and upward mobility seemed inextricably linked to the play of theoretically superior teams. But here we are, firmly entrenched in Week Four of the College Football Playoff Rankings, and things actually seem to be playing out in logical fashion. I’ve previously criticized ranking systems for many things, but the two biggest concerns I voiced focused on the insistence of those systems to serve brand recognition over on-field performance, and the notion that the ranking systems probably wouldn’t believe themselves if held at gun point. The first gripe makes sense for any fan located outside the gilded golden cage of the SEC. For instance, it must be frustrating for TCU, a team that won 95 games in the ’00s, to still have voters question their validity as an “elite” team. Forget that they won more than Alabama in the most recent complete decade, they won more than Georgia and LSU too. Unfortunately, they lived in a world that wouldn’t allow them to play those teams under virtually any circumstances2, which means that we theoretically needed the rankings to decide which team was better, TCU or SEC Team of the Year. The second issue is a bit more abstract. Currently, the top 10 teams in the country are, in order: Alabama, Oregon, Florida State, Mississippi State, TCU, Ohio State, Baylor, Ole Miss, UCLA and Georgia. That’s a pretty good top 10. I actually believe that at least the majority of the best 10 teams in the country are in that top 10, and the order seems to be surprisingly inoffensive. And that is a radical change. Traditionally, the rankings appear as some sort of hybrid justification/rationalization/contextualization, and they do very little alone the lines of ranking things from best to 25th best. Teams lose to top ranked opponents by slim margins and tumble, which makes sense in exactly zero worlds. If a team is supposedly the best team, shouldn’t a close game actually allow a team to climb on occasion? Like Clemson, in Week 4, for instance. They took a Jameis Winston-less Florida State team to overtime, were within a freak fumble from winning, and somehow tumbled out of the Top 25 in both the AP and USA Today polls. On the other side of that same point, an undefeated Arizona team needed a controversial celebration penalty to go against Oregon — sans basically their whole offensive line — to knock off the then-second (AP) ranked Ducks. Arizona was undefeated and unranked at the time, but their performance bumped them up to #10 in the AP, while Oregon slipped to #12. At the same time, Michigan State, who lost to the Ducks by 19 four weeks prior, climbed to #8 in the same poll. That makes me wonder: Did the voters in that moment really believe that in a vacuum — the way I imagine the ranking systems are supposed to be observed in — that Michigan State was a better team than Oregon and Arizona, given the only evidence relating to the claim was a blowout loss to the lowest ranked team in question? It made little sense then and it makes less sense now, now that Oregon has steamrolled everything in its path since the Arizona slip-up. That’s why it’s fountain Sprite-level refreshing to see the College Football Playoff High Council of Asgard not kill Mississippi State for barely losing to a team that Vegas, the general public and just about every pundit claimed was already superior. It’s also nice to see Alabama take Mississippi State’s top spot. It’s not a new thing to complain about the rankings, and ignoring them would probably do everyone — myself most of all — a lot of good. But for once, it’s cool to see a set of rankings that the voters might actually believe themselves.